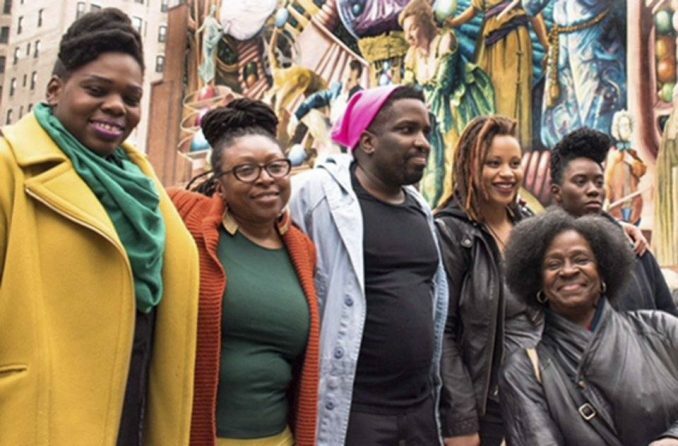 Members of The Womanist Working Collective and the Black and Brown Workers Cooperative in front of the Philadelphia Muses mural. The Black and Brown Workers Cooperative organized a press conference outside the office of Philadelphia FIGHT on March 1 to denounce racist, sexist and anti-labor practices at the agency, which provides services to people living with HIV/AIDS. BBWC Co-Founder Abdul-Aliy Muhammad read a list of 10 demands, including the immediate resignation of Executive Director Jane Shull and Medical Director Karam Mounzer. Philadelphia Councilmember Helen Gym, ACT UP Philadelphia, the Womanist Working Collective and workers from West Philadelphia Federally Qualified Health Centers all made statements supporting BBWC’s call for institutional change at the nonprofit.